Tango clothing from Barcelona – UP-Tango elegance. For a fashion designer Barcelona is a never ending source of inspiration. Day and night bars and public places are crowed with people from around the world conscious for new trends, styles and labels. 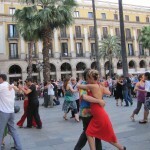 Also the cosmopolitan tango community of Barcelona presents itself as colourful and full of ideas. New trends of dance fashion and tango clothing are best discovered while taking a stroll through the vibrating night life of the city. Also UP-Tango designer Ute Prause is regularly out to visit the tango bars, tango concerts, milogas and all kind of tango events to get inspired for the creation of her tango clothing designs and not to forget, to present her tango dresses and dance wear to the tango dancers of Barcelona. Last Sunday the tango show “ENSUEÑO TANGO” offered an excellent opportunity to check out new trends of tango clothing and dance wear fashion. The creator of the tango event focused on the artistic presentation of the tango way of life and emotions of the dance. The tango dancers Silvia Lezcano, Giovanni Galvez Corral and Omar Quiroga were moving to the bandeón of Marcelo Mercadante to explore the universe of tango. 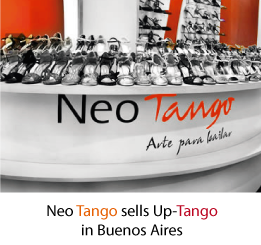 Find a whole universe of tango clothing and dance wear in the UP-Tango Barcelona Fashion Design online shop. The clear and elegant designs of tango dresses, dance trousers, tango skirts and tango tops were designed with high precision and produced in Barcelona under fair conditions. Don’t miss attractive spring offers on dance dresses. Visit the UP- Tango Online Shop!